I've been the Family Potato Salad Maker for years. On both my side of the family and my husband's side, I'm the one who is asked to bring the potato salad to summer gatherings. This task bodes well for me since potato salad is one of my all-time favorite dishes ... so long as the potato salad is made right. I'm severely and unapologetically picky about 'tater salad. I want nothing to do with any that comes close to resembling the kind found lurking behind the glass at most deli counters or the kind in those plastic pails next to the rotisserie chicken display at the supermarket. You know the ones. They are often slimy and heavily laden with pimentos. And, I don't care for potato salad made with sweet relish or sweet pickles. Also, I cringe when the potatoes are not cooked long enough. And, I like the potatoes cut into itty, bitty cubes. Furthermore, I don't understand the logic behind boiled potatoes simply coated with a little mayo and mustard (a.k.a. bland potato salad ). 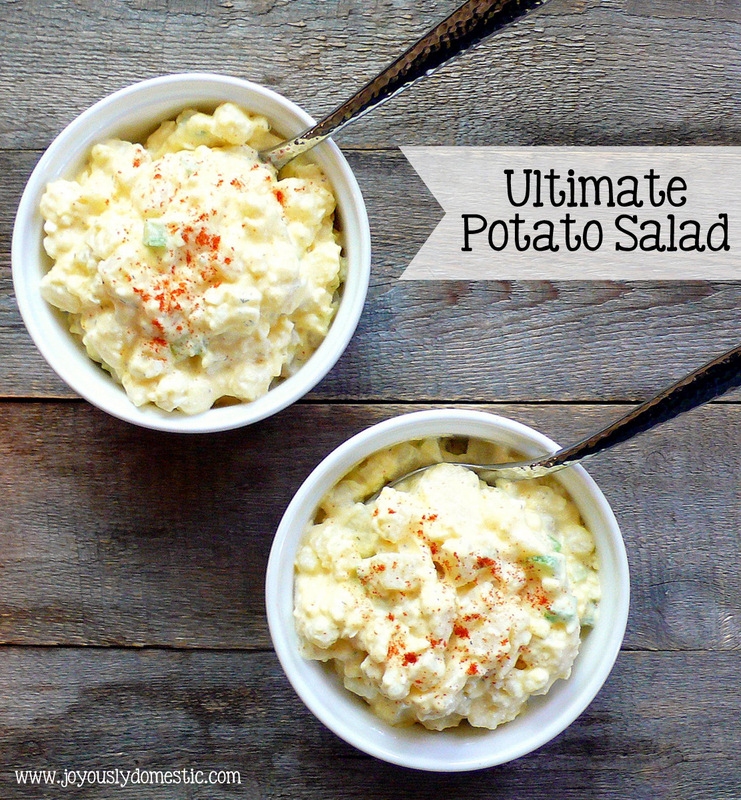 I cherish a potato salad that is complex in flavor even though it is considered a simple side dish. It has to have the right vinegar-to-sugar ratio in the mix as it's all about balance to me. When everything comes together as it should, it's a beautiful (and scrumptious) thing! See ... told ya I was picky. Many friends and family members have requested my recipe through the years. The problem has always been that I'd never really measured anything. I just eye-balled everything as I went along. But, I have spent a lot of time recently working on nailing down the precise measurements and writing up an actual recipe for my tried-and-true potato salad. So, now I'm finally able to share it here with you. There are a couple of key steps that I think really help make this recipe a true winner. Drizzling some vinegar over the potatoes while they are steaming hot (right after draining) is one of those key steps. Don't skip it. It makes a world of difference. And, mixing together the dressing with the potatoes, onions, celery and eggs while the potatoes are still warm is another key component to this recipe. The result is a super creamy, you'll-think-you-died-and-went-to-heaven potato salad that is sure to make you the rock star at your next summer party. Place the cubed potatoes in a large pot. Cover with cold water. Bring to a boil over high heat, then reduce heat to medium. Cook potatoes until they are soft, but not entirely mushy. Drain water off using a colander. Spread potatoes out in an even layer onto a large baking sheet. Drizzle the hot potatoes with 3 tablespoons of vinegar. Sprinkle on 1/2 tablespoon of salt and 1 teaspoon pepper. Allow potatoes to slightly cool while you prep the remaining components of the recipe. In a large mixing bowl, add the eggs, onion and celery. Set aside. In a medium mixing bowl, combine the ingredients for the dressing using a whisk. Blend until smooth. Once potatoes have cooled slightly for about ten minutes, add them into the large bowl containing the eggs, onion and celery. Pour the dressing over the potatoes. Stir gently until everything is well-combined and coated. Store in an airtight container until time of service. Best if used within three days. Additional paprika can be sprinkled on top for color if desired. So glad you took the time to test out the measurements and record this! You'll be able to pass it down for generations to come. My mom is the Family Potato Salad Maker, and yeah...she doesn't have measurements. I tried making her recipe (which actually has 95% the same ingredients as yours) one time by memory/eyeballing it, and it wasn't the same at all! haha. Do you know how epic this is?!?! I am the same as the other post, I eyeball all the ingredients, and, even tho it usually comes out good, it is not consistent. Thank you for doing all the hard work my lazy self can not manage. I am printing this out now! Awesome, Leah! Hope you enjoy this recipe as much as we do! It's a winner in my book! :) Happy summer! Hi, Robin. To clarify, I stated in the opening of this post that I didn't like SWEET relish in potato salad. I do, however, include a little dill pickle juice in the dressing, but I'm not sure where you're seeing that I included relish? As far as the mustard question, I'm not sure what you mean. What I stated in the section about things I don't care for in potato salad is when the cooked potatoes are just simply coated in mayo and mustard (as compared to a dressing that has a little more complexity). I didn't say I didn't like mustard. Actually, I like it a lot. I do include a little in my dressing in fact, but it doesn't overwhelm the things by any means. Hope that answers your questions. I'm sorry for any confusion you may have had.